Whether you spell if Bulgogi or Bool Kogi this grilled steak dish is as delicious as it is versatile. Start with marinated tender strips of beef, grill and serve however you like. Traditionally, this dish is served wrapped in sesame or lettuce leaves. You can also pile it up on rice. Bulgogi makes a delectable meal and a perfect appetizer. You can even substitute the beef with chicken, fish, pork, or any other meat you have on hand. The basic technique is to marinate the meat in a mixture of soy sauce, sesame oil,​and green onions. Because the marinade contains sugar, you need to keep a close eye on the meat while grilling. The best method is hot and fast. Once the meat is grilled, it should be served pretty quickly as it can get tough if left too long. Bulgogi is usually served with a dipping sauce. There are two ways to prepare the meat for this recipe. The simpler method is to marinate the whole piece(s) of steak for up to six hours. Grill it, slice and serve. The other method, considered more traditional, is to slice the uncooked meat into 1/4 inch thick pieces, marinate for about an hour and then grill. To use the second method will require that you either place the meat on skewers or use some kind of grilling basket to keep the small pieces from falling through. While the first method is easier, the second method exposes more of the meat's surface to the marinade and the flame, giving it a better flavor. 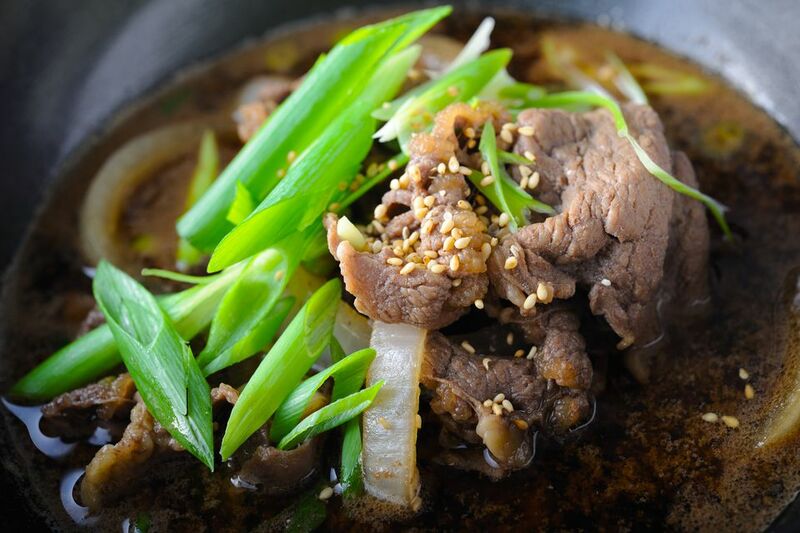 The dipping sauce served with Bulgogi is generally spicy; after all, the literal translation of Bulgogi is "fire meat". However, you can use your favorite dipping sauce instead. This dish is particularly good accompanied by a peanut sauce. Anyway, you serve it, I'm sure you'll find this dish fitting for most any occasion. Grilled Steak Amazing & Easy!